Water tanks on narrow boats are used for storing and dispensing potable or drinking water and for storing toilet waste. 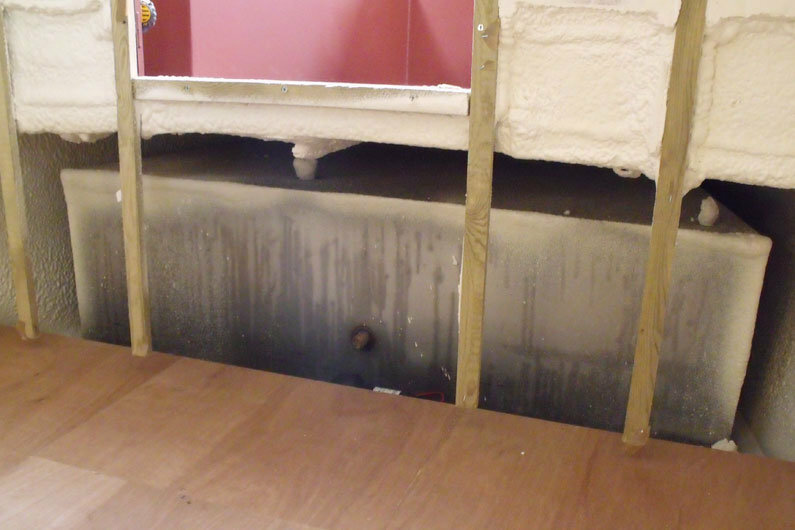 Waste water from washing, doing the dishes and washing machines goes straight in to the waterways through a skin fitting in the side of the hull. Tanks are made of several different materials and can be designed and fabricated to any size you require. Narrow boats are conventionally built with what are known as integral tanks. Commonly set in the bow so they naturally drain towards the stern, the steel of the shell and an internal bulkhead form the sides of the tank. Through fittings on the bulkhead provide attachment points for stop valves and filling is done from above via a specially designed filler and cap assembly. 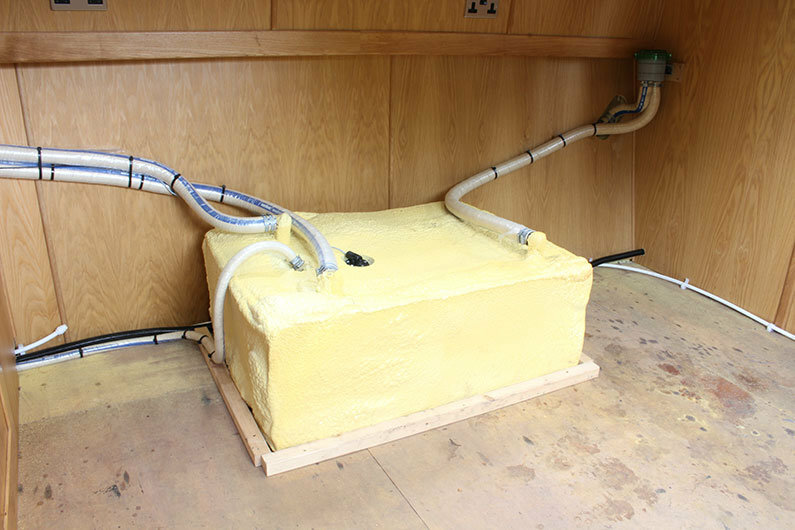 If you are buying a brand new narrowboat from a canal boat builder there is usually no extra cost for these tanks and the main advantage is that the narrow boat bow space can be fully utilised for water storage. An average size would be around 500l capacity but with advances in shell design and the requirements of customers used to baths and washing machines, 1000l tanks are not uncommon. 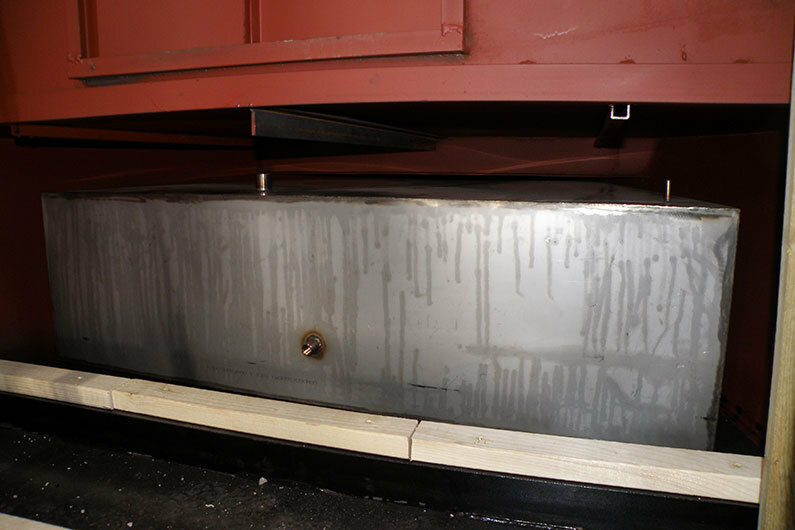 For maintenance, a sealed access hatch is usually cut into the top of tank, which is usually the foredeck. And maintain it you will have to. Eventually the tank will need cleaning and re-coating. This is recommended to be done every 3 to 5 years to help prevent bacterial, fungal and rust growth. Rust formation inside steel bow tanks is common and is characterised by brown water running from the tanks. Many narrowboat owners who infrequently use their boat will experience a few minute of brown running water when they first turn on the taps. This soon clears, but is a sure indication that the tank, and any mild steel connecting pipework, needs attention. Specialist water proof, tank safe paints are used to renew degraded surfaces but in order for them to be successfully applied the tank requires meticulous cleaning, completely drying out (and we mean totally otherwise the coating will not stick and the rust will return within 6 months) and at least 2 coats of specialist paint applying. Closely follow manufacturers guide lines when applying these coatings as this is a thankless task and really needs to be done right first time. Usually fitted into the bow of a narrowboat. These tanks are more often than not sealed for life for maintenance due to the non corroding nature of the material. However, they still require sanitising regularly. They are usually an extra cost option from narrow boat builders, but can be customised to any shape or size. Although more expensive than an integral tank, the benefits of being maintenance free is an attractive option. If you are buying a new sailaway canal boat with an enclosed bow, you need to consider where the water tanks will be housed. One solution could be under the main cabin bed. As with stainless steel tanks, these can be moulded to any shape or size. One specialist supplier has a huge range of ready made tanks for all occasions. They can also customise units with customer specific inlets and outlets. Don’t use clear or opaque tanks for fresh water supply. You will grow weeds if you use your tank infrequently. Black tanks are used in this application to prevent the growth of algae. Ready made bladder tanks of various sizes are available from most good chandlers. Initially developed for small cruisers for installation in lockers and under bed spaces, they may be too small for most narrow boat applications. However, for small narrowboats whose owners do not require customised fittings they are ideal. It is also possible to have these bladder tanks custom made. This is ideal of you have an awkward space in the bow, perhaps due to having a retro fitted bow thruster or if your original integral tank is giving problems. The specialist manufacturer will construct a bag liner to the exact dimensions of your integral unit. The bladder is seam welded and brass or plastic fittings are custom positioned to suit you filler port and outlet. The existing tank can be insulated, which also takes care of any sharp welds etc which could be abrasive to the liner, and the bladder is simply dropped in through the existing access hatch. Water treatment modules can be inserted into the bladder at the point of manufacture should you wish. Expect to loose about a fifth of your original capacity if you choose this system, but the benefits are clear. Sanitise all the above tank systems with purpose formulated products in powder of tablet form at least once per season. If using water soluble tablets and powders, dissolve them first before introducing them into the tank. The effervescent nature of these treatments can damage tank coatings and rubber if concentrated in one area.